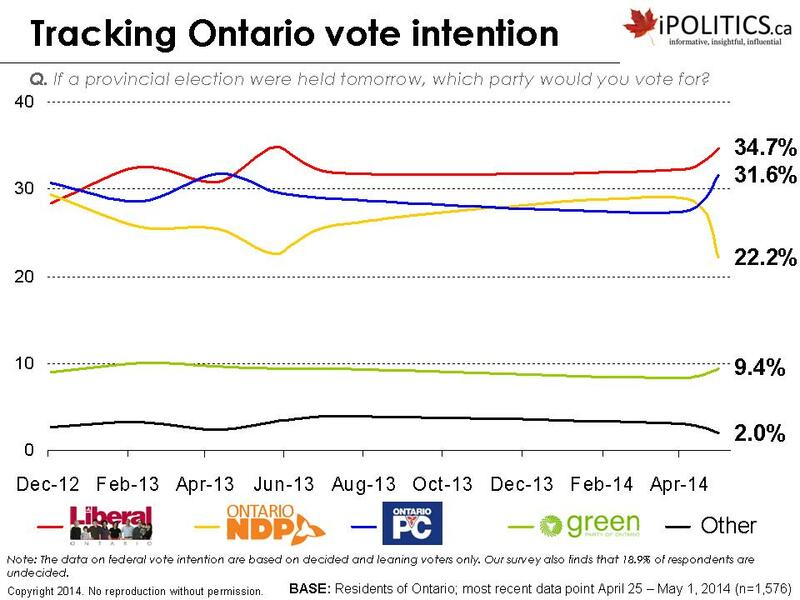 [Ottawa – May 23, 2014] – The Ontario provincial campaign has settled into a pretty locked-in pattern. With a fairly high incidence of undecided voters (18 per cent), however, things could easily change and voters may be finding it hard to choose between distinct agendas: one focussed on pretty dramatic change, one focussed on minimal government and austerity (which our broader polling shows to be increasingly unpopular with a skeptical public), and a strong activist government model. [Ottawa – May 16, 2014] – The Ontario provincial campaign is shaping up to be one of the most interesting campaigns in recent political history. It features two sharply contradictory policy visions: an austerity/minimal government model versus a progressive, active state intervention model. Superimposed on that stark choice is the regime fatigue and ethical issues which are confounding the voters’ decision making in ways which make the outcome of this race highly uncertain. These dynamics are also placing challenges on pollsters trying to accurately gauge exactly where voters are and where they may go. More on this later. [Ottawa – May 2, 2014] – In our latest poll, it appears that not one of Ontario’s three major parties have any real incentive to call an election. The Liberals and the Progressive Conservatives are both sitting slightly below their 2011 election results at 35 and 32 points, respectively. At 22 points, however, the NDP are down 7 points over last month’s poll. [Ottawa – April 9, 2014] – Our latest Ontario poll will come as something as a disappointment for those hoping for some kind of dramatic shake-up in Ontario’s horserace. While the Ontario NDP has picked up three points since July, nudging the Progressive Conservatives ever so gently down to third place, the overall picture remains largely stable. The Liberals are holding steady at 32 points, with the NDP sitting closely behind at 29 points. At 27 points, the Progressive Conservative Party remains well within striking distance of the first-place Liberals. [Ottawa – July 19, 2013] – After an exciting few months that saw the Ontario Liberals vaulted from last place to first to second to first again, it appears that Ontario’s political landscape is beginning to settle as Canadians break for the summer. While the five-point lead enjoyed by the Ontario Liberals in May has discreetly shrunk to a slightly less comfortable three-point margin, the overall picture has remained relatively stable. [Ottawa – April 16, 2013] – Back in February, our poll showed that Kathleen Wynne had been successful in breathing new life into the Ontario Liberal Party. The party had elected a new leader and, as is typical in the wake of a widely-covered and highly-energized leadership race, party supporters across the province were ecstatic. The party jumped from the losing end of a three-way tie to enjoying a small but statistically significant lead over the two opposition parties. TIME TO TAKE THE DISCRETIONARY OUT OF DEMOCRACY? [OTTAWA – October 7, 2011] – Ontario’s 2011 election was exciting and offered a number of surprises and we at EKOS are pleased that not only did we accurately project the popular vote, we believe we did a good job in charting the direction of the election. For instance, we were the first to call a Liberal victory in our September 27th release. [Ottawa – October 5, 2011 (morning)] – In what would have been unthinkable as little as a week ago, McGuinty’s Liberals appear headed towards a majority. Our three-day roll-up of more than 2,000 Ontario residents puts the Ontario Liberal Party at 39.0 per cent, a full nine points ahead of the Progressive Conservative Party who now stand at 29.7 per cent. The Ontario NDP, meanwhile, is at 23.1 points and the Green Party is sitting at 6.6. [Ottawa – September 27, 2011] – With barely a week to go until the 40th Ontario general election, McGuinty’s Liberals have a slight but statistically significant lead over Hudak’s Progressive Conservative Party (34.9 to 31.4). 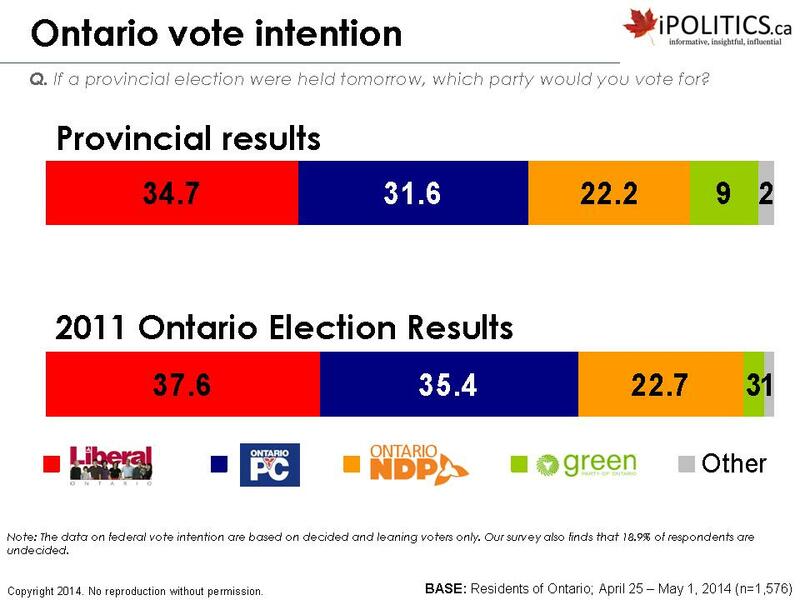 Horwath and the NDP, meanwhile, are further back at 24.7 points.